The Anniversary Exhibition TransCaspian was attended by 54 companies, organizations and industrial structures from Azerbaijan, Germany, Iran, China, Latvia, Russia, Turkey, Ukraine, France, Czechia. Along with commercial companies the Exhibition was attended by state structures including the Ministry of Transport of Azerbaijan, the Azerbaijan Railways, the Azerbaijan Caspian Shipping Company, Baku International Sea Trade Port, Baku Underground, Russian Maritime Register of Shipping in Azerbaijan, as well as the representatives of main industrial structures, international organizations. Since the foundation the Exhibition closely cooperates and receives support from the PS IGC TRACECA and the Ministry of Transport of the Republic of Azerbaijan. For 10 years the exhibition TransCaspian became an important transport forum in the region making it possible to demonstrate innovative technologies and equipment for transport industry, to open new representative offices, to establish joint ventures. 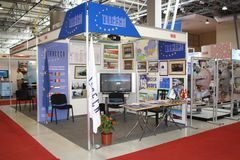 Common display space gathers serious exhibitors, including the PS IGC TRACECA, as well as logistical operators, carriers, railway, shipping and air transport companies, shipbuilding and road-building companies, distributors of commercial transport, ports and many other transport enterprises. The distinctive feature of TransCaspian 2011 is that for the first time simultaneously with the exhibition there was held the debut of the project of the 1st Caspian International Conference on the subject “Development of Transport Infrastructure of Azerbaijan and Role of the Country as a Transit Link at the Intersection of Strategic Transport Corridors”. The conference was attended by the Minister of Transport of the Republic of Azerbaijan, Mr. Ziya Mamedov, the Minister of Transport of the Russian Federation, Mr. Igor Levitin, the National Secretary (Permanent Representative) of the PS IGC TRACECA, Mr. Akif Mustafayev, as well as the representatives of public transport structures, commercial and non-government organizations. The participants of the plenary sessions of the Conference discussed the projects of road transport infrastructure and the development perspectives, public transport, smart systems of transport control and road safety, the initiatives and trends of international traffic development. Within the framework of three-day exhibition TransCaspian 2011 the TRACECA stand was visited by the representatives of the Embassies of the TRACECA member states in the MLA Parties as well as by the interested diplomatic representations and the invited guests including H.E. Ambassador of the Republic of Kazakhstan in the Republic of Azerbaijan, Mr. Serik Primbetov, H.E. Ambassador of the Republic of Lithuania in the Republic of Azerbaijan, Mr. Kestutis Kudzmanas and Consul of the Republic of Lithuania in the Republic of Azerbaijan, Ms Sarune Kubiliute, H.E. Ambassador of the Republic of Belarus in the Republic of Azerbaijan, Mr. Nikolay Patskevich, economic adviser of the Republic of Bulgaria in the Republic of Azerbaijan, Mr. Staico Staicov counselor of state of the Embassy of the Czech Republic in the Republic of Azerbaijan, Mr. Yozef Marshichek, economic adviser of the USA Embassy in the Republic of Azerbaijan, Mr. Kleyton Suop, attaché of the Embassy of Japan in the Republic of Azerbaijan, Ms. Megumi Maecava, as well as the expert of the TRACECA Project “Logistical Centres and Motorways of the Sea”(LOGMOS), Mr. Michel Geriotte and others. The Minister of Transport of the Russian Federation, Mr. Levitin and the Minister of Transport of the Republic of Azerbaijan, Mr. Mamedov became familiar with the TRACECA expositions. At the TRACECA stand Mr. Levitin and Mr. Mamedov were informed on the latest achievements within TRACECA, the Strategy of the IGC TRACECA for the period up to 2015, the on-going TRACECA projects as well as measures to further development. The exhibition participants emphasized the progress in the expansion of exhibitors’ geography, the development of the whole action confirmed by the growth of exposition area making 60% and the two-fold increase in the participants’ number. It should also be noted that this year the newcomer companies made 30% of the total number of participants. The list of newcomers includes: Riga Trade Port, Astrakhan Port Ola, CNR Corporation (China), Mott McDonald (Czechia), as well as Latvian National Stand. The outcomes of the exhibition testify to the fact that the Anniversary TransCaspian became a standard of professional forum which collected quite a lot of favourable comments. On completion the exhibition organizers presented the Permanent Secretariat of the IGC TRACECA with a Certificate of Gratitude for support, participation and many years of cooperation.